Our tree has just come into the house. Cut this morning, a nine-foot Douglas fir, it has all the odour of the winter forest, and its boughs are so green and lush that I’m almost tempted to say, “Let’s leave it naked this year.” A paradox — to dress an evergreen in baubles and stars? Little ceramic birds? To remind it of the world it’s been taken from, to give us green through the darkest days? No living bird will settle on these boughs again. No snow will accumulate on the needles, no cones will form. Tomorrow we’ll pull out the boxes of decorations and place them on every branch, against the trunk, the one special star on the top (which had to be trimmed to fit into our house). For now, I want to stand on the edge of the room and look at its splendid undressed beauty. Trees bring in the scent of the outdoors and they remind us too of moments when we sat by them, cut them for firewood, burned them gratefully all winter for their heat, brushed against them and ran our fingers along their various barks, reminded of them later as we raised resiny hands to our faces. 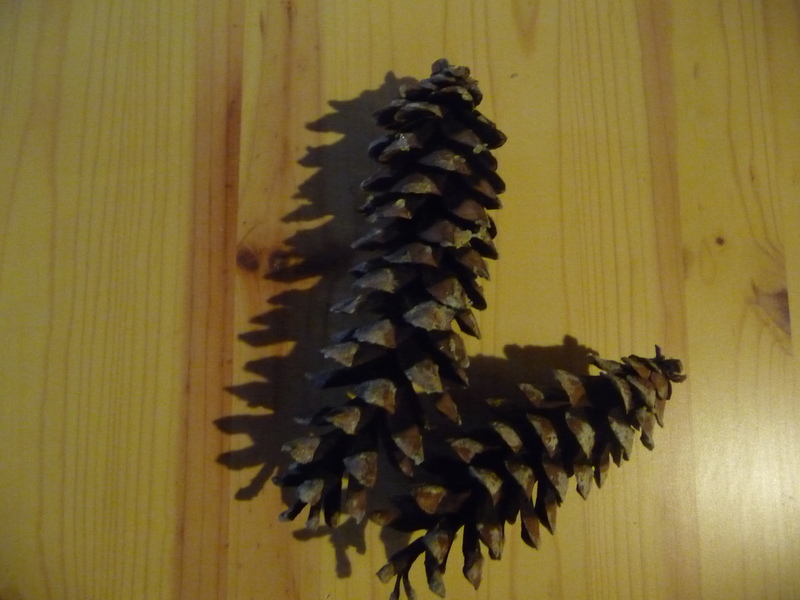 I don’t have cones from this tree but here’s a pair of elegant long cones I picked up under a small stand of Pinus monticola at the Dominion Arboretum in Ottawa last month while walking there with Forrest and Manon. They still smell alive. They can stand in for absence, tokens of affection, what we keep to remember the miles between us this time of year. ~ by theresakishkan on December 23, 2014. Oh, the smell of trees! I wish ours had that fresh-cut forest smell. But then I’m not sure 9 feet would work in our house! I hope you enjoy the decorating. We’ve already accumulated so many ‘precious’ child-made decorations — it’s so special getting these little treasures out each year. Happy Christmas! Sarah, there’s only one place in our house where a nine foot tree can go! And the boxes of decorations — yes, nothing is ever discarded so there are lots of angels cut out of wallpaper with macaroni glued on, lumpy stars cut out of baking clay, chains of coloured paper…Every one of them has a story attached or at least a small memory. This entry was posted on December 23, 2014 at 10:37 pm and is filed under Uncategorized.You can follow any responses to this entry through the RSS 2.0 feed.You can leave a response, or trackback from your own site.